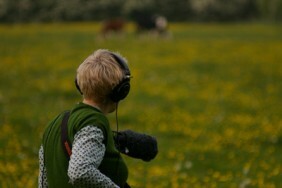 Felicity Ford works across a wide variety of platforms to engage the public in new ways of hearing. Celebrating everyday life through a playful and imaginative focus on sounds and listening, she has particular interests in linking sounds with material culture, documentary sound-recording processes, and listening as a way of exploring social contexts. In her practice a recipe or shopping list become an instruction score; wallpaper becomes the basis for an imaginative sound-recording and composing project; and hand-knitting a sound-system becomes a way of connecting voices and sounds to specific landscapes and communities. Since completing her PhD in 2011 on The Domestic Soundscape and beyond... Presenting Everyday Sounds to Audiences, she has completed several commissions includingSonic Wallpapers for the Museum of Domestic Design and Architecture, a film soundtrack for the Wellcome Library and the BFI for a 1930s antenatal care film entitled Bathing & Dressing, Parts 1 & 2, and a knitted soundsystem with accompanying composition entitled Hûrd – A KNITSONIK™ PRODUKTION for the Wool Marketing Board and Rheged gallery. She maintains her connections with the Sonic Art Research Unit at Oxford Brookes University, the work of which she documents and archives, and she co-runs the Sound Diaries website with Prof. Paul Whitty. Her interest in documentary radio processes led her to working with Valeria Merlini in 2011 and 2012, co-running documentation workshops at the Tuned City Festival in Tallinn, Estonia, and the Audiograft Festival in Oxford, UK.